A reported $2.5 bln bid from Hindalco for U.S. aluminium producer Aleris would mark a shift in focus to growth for Kumar Mangalam Birla. The headline price is punchy. But surging demand for electric vehicles and more fuel-efficient petrol cars should be great news for the metal. An employee walks past rolls of aluminum foil in a shop of the Rusal's SAYANAL foil mill outside the town of Sayanogorsk, Russia, September 3, 2015. 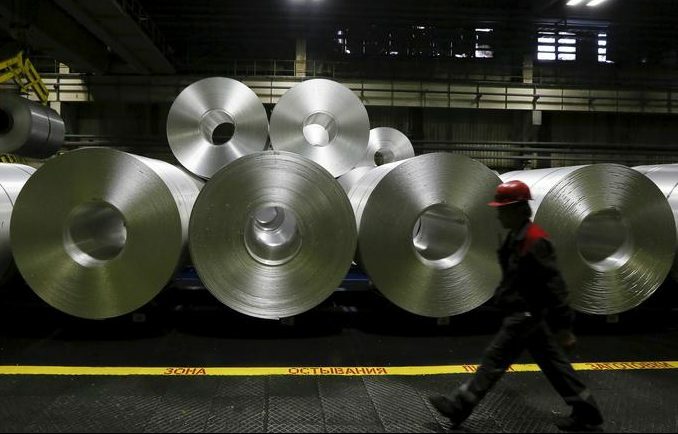 India's Hindalco has submitted a $2.5 billion bid for aluminium producer Aleris, Bloomberg reported on Jan. 4, citing people with knowledge of the matter. Mumbai-listed Hindalco made a non-binding offer through its privately held U.S. unit, Novelis, the sources added. Ohio-based Aleris is owned by Oaktree Capital and Apollo Global Management. Aleris had earlier agreed to sell itself to Zhongwang USA for an enterprise value of $2.3 billion. That deal was scrapped after U.S. officials raised national security concerns about the Chinese-backed bidder. Hindalco has a market capitalisation of $9.8 billion.